Income investors stand to see a more significant boost than last year's tiny dividend hike. Procter & Gamble (NYSE:PG) knows all about dividend raises. The consumer goods titan has hiked its payout in each of the last sixty years for one of the longest streaks in the stock market. Yet the rate of increases has gotten much smaller lately. In fact, shareholders haven't seen a boost to the payout rate since 2008, when it improved from 13% to 14%. In contrast, this year's increase was about as tiny as it could be -- less than 1%. Annual dividend raises. Data source: P&G financial filings, chart by author. There are good reasons to expect the dividend outlook to improve from here, though. In fiscal 2015, P&G's payout soaked up a dangerously high percentage of profits. The $2.59-per-share dividend swamped the $2.44 per share that the company produced in earnings, leading to a payout ratio significantly above 100%. That unsustainable situation got better over the last 12 months, but only slightly. The dividend amounted to over 70% of earnings in fiscal 2016, far ahead of the 50% figure that most blue-chip businesses aim for. Thus, it made sense for management to be conservative about their latest payout boost. 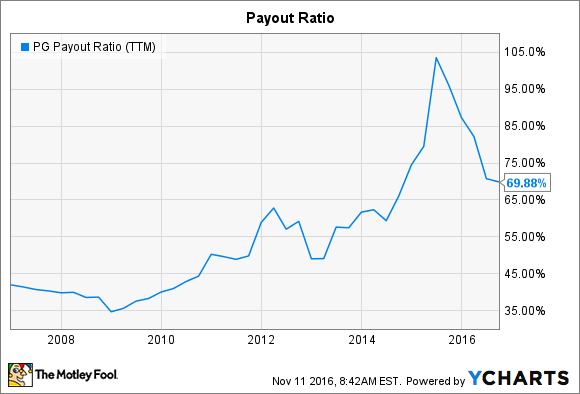 The payout ratio should continue improving even if core earnings don't grow quickly. That's because the two biggest drags against P&G's profits -- foreign currency swings and its brand divestment initiatives -- are both winding down and won't be pressuring reported earnings nearly as much. Operating trends are improving as well. Organic sales growth was 1% in the first quarter of the year, rose to 2% in the second quarter, and reached 3% in the quarter that just closed. That momentum bolsters management's forecast calling for P&G's fiscal 2017 to mark its first uptick in annual organic sales growth in three years. Organic growth by calendar quarter. Image source: P&G investor presentation. Notably, the organic growth has been volume-driven lately, meaning that P&G didn't need to count on higher prices alone to pull revenue up. And for a change, the company is finally beating rivals. Kimberly-Clark (NYSE:KMB), which competes with P&G's biggest brand, Pampers, last posted flat organic growth. P&G is still struggling to hold market share overall, but it is gaining share in some key categories, like diapers, and the pace of overall decline has improved. P&G can't do much about a sales environment for consumer goods that seems likely to bump along at near zero growth. It has complete control over its costs, though, and that's one area where management has demonstrated great execution. The company has cut an average of $1.4 billion out of its annual cost of goods sold expenses in each of the last five years and executives plan to boost that figure to as much as $2 billion over the next five years. These big-time savings promise to push gross profit margin higher even if the industry logs another year of disappointing growth. And as a fundamentally more profitable business, P&G should be able to afford heftier dividend increases. With dividends taking up more than two-thirds of profits, it's not likely that investors will see a return to double-digit raises any time soon. However, the key financial and operating trends imply stronger growth ahead for patient income investors. In the meantime, brand divestments have left P&G absolutely flush with cash, most of which the company plans to shower on shareholders in the form of stock repurchases.